Talk about a perfect post Booty workout meal. 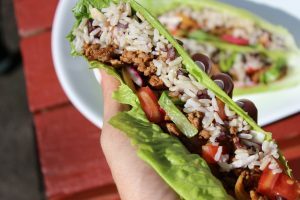 This meal is filled with all the right macronutrients, and is perfect for all Booty types! The Booty Building Box program offers nutrition for pre and post workout meals, if you’re going to work your booty off you should know how to feed it before and after training to avoid muscle breakdown and to recover. Meal prepping is probably the hardest part about staying on track, which is also the reason why the Booty Building Box programs wanted to keep it simple. Two workouts a week, 4 planned meals. It’s easy to stick to, no excuses. Brown, black or wild rice is a great staple in your diet for any fitness goals. Even white rice will do, coloured rice just offers more antioxidants. This grain is a great way to get clean carbohydrates into your post workout meal. It takes 20min to cook, and remember the ratio 1 cup of rice for 2 cups of water. Onto the juicy part, 4-5 oz of lean beef sautéed in a pan with fresh herbs and veggies. Ultimately you can choose what seasoning you like best, this recipe starts out by adding a little bit of olive oil to the pan with minced onions and garlic, salt, pepper and little bit of paprika. Once this base is simmering add in the beef. If you want to get creative and try different spices like taco seasoning it tastes amazing. While the beef is simmering, chop up fresh veggies for the wrap. Tomatoes, avocado, peppers, onions and mushrooms (even sauté basil & mushrooms once the beef is done to add in extra flavour). Then once your beef and extra veggies are cooked, pile into the lettuce wrap with 1/2 cup of rice. Add in some hot sauce for an extra kick. Hot sauce is a fantastic condiment, it has very little calories and helps burn fat from the cayenne extract. Enjoy!